2012 Sao Paulo motor show highlights | What Car? The Sao Paulo motor show doesn't have the high profile of big European motor shows, but Brazil is an important market for car manufacturers and they turned out in force to showcase their latest models. Although many of the cars on display were South American market models that bear little relation to those sold in the UK, there were plenty of familiar sights, including the latest BMW 3 Series, new Ford Mondeo (wearing its US-based Fusion badge) and the 2012 Hyundai Santa Fe. The car market in Brazil is very different to the UK's. Despite a growing middle class, there's an abundance of small, cheap cars, many of which are based on models that are several generations old by European standards. There's also a preference for rugged SUV-style vehicles, and if the roads in Sao Paulo are anything to go by, we can see why. It's hardly surprising, then, that one of the key themes of the show was affordable SUVs. Here are our top five cars of the show. Volkswagen says its decision to unveil the Taigun concept car in Sao Paulo is a tribute to Brazil. VW has been building cars here since 1953, and its Gol (which isn't related to the Golf, despite the name) has been the best-selling car in Brazil since 1997. A production version of the Taigun is highly likely. VW development boss Ulrich Hackenberg told us that the concept car would be used to gauge public and media reaction; if it's positive the car could be launched on the international stage within two years. The Taigun is based on the Up city car, and the concept car on show uses the same turbocharged three-cylinder engine that will power next year's VW Up GT hot hatch. 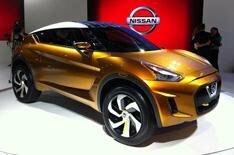 The Nissan Extrem is another SUV concept car making its debut at the show. Where the Taigun is boxy and upright, the Extrem is swoopy and sporty. It's the same width as a Nissan Juke, but the Extrem is shorter, lower and much more aggressive. Nissan says there are no plans for a production version, but that the Extrem's styling will influence its future models. The new Renault Clio Mercosur is evidence that, despite the growing number of 'global' models, there's still a place for cars built for local markets. Just a month after the all-new Clio was launched at the 2012 Paris motor show, the latest Clio Mercosur made its debut in Brazil. The two cars are similar at the front, but look beyond that and it's clear the Mercosur is based on the second-generation Clio that was launched in 1998. On the whole, Renault's Brazilian range bears little relation to its UK line-up. Renault Duster and Sandero models were on display here, whereas these are sold as Dacias in the UK. The Ford Ecosport had another motor show outing at Sao Paulo. The Ecosport was unveiled at the Delhi motor show in January, and it was originally destined for markets such as Brazil, China and India. In September, Ford announced that it intends to sell the Ecosport in Europe in late 2013, to rival cars such as the Nissan Juke, Skoda Yeti and Vauxhall Mokka. The Ecosport has the right image and, because it's based on the Fiesta, it should be good to drive. Its interior and exterior trim looks disappointingly cheap in places, but if Ford can keep the price low enough it should grab a piece of an expanding market. In among the cheap and cheerful SUVs that dominated the show, Mercedes' slinky Concept Style Coupe a four-door saloon looked strangely out of place on its dark wooden plinth. The Concept Style Coupe made its debut at the 2012 Beijing motor show and its coupe-style looks were just as compelling here. We think it's one of the best-looking Mercedes models in recent years. Let's hope the production version which is likely to be called CLA and will be based on the latest A-Class doesn't look too different when it goes on sale next autumn.